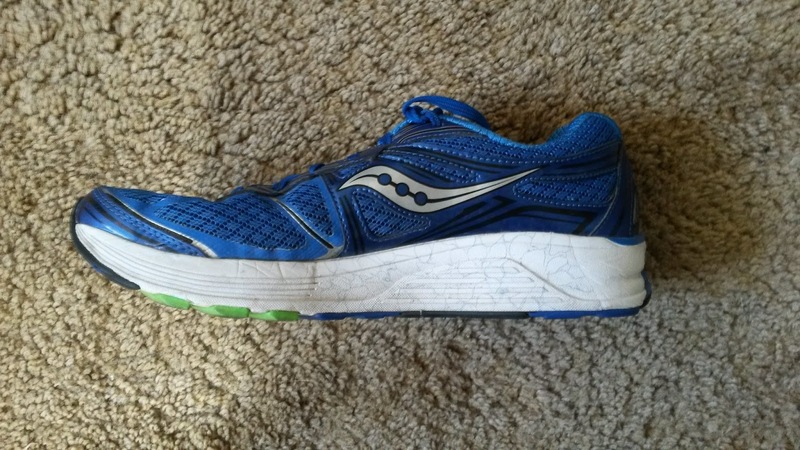 Sole/Ride/Drop: As with Saucony shoes, the ride of the Guide 9 is on the firmer side. The EverRun and EVA sole do not lead to an overly soft ride like most Adidas Boost shoes. I actually did not notice the EverRun until I started running. This "topsole" material (located above the midsole) really shines the longer you get into a run. I feel like EverRun primarily helps disperse force as my feet and legs have felt a bit less beat up than normal. 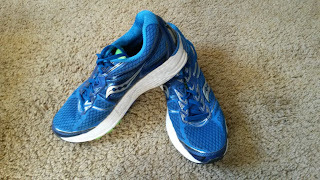 However I also feel that the ride is a bit more bouncy than previous iterations of Saucony Trainers. The Guide 9 still feels firm but forgiving without being soft. The firmer ride works well with the dual density posting/support in the medial heel and midfoot. I did not find the support to be intrusive at all, instead it is integrated very well with the sole and guides the foot well (pun). The Guide 9 is definitely a moderate level stability shoe that provides plenty of support for those who need additional help. The drop is listed at 8mm and that is exactly how it feels. The moderate drop contributes to a relatively smooth ride regardless of where you land. Never once did I feel like the heel was getting in the way of my stride. The EverRun also contributed to smoother ride along with improved flexibility in the forefoot of the shoe. 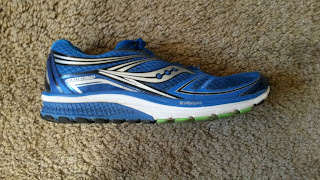 Saucony put deeper flex grooves in the shoe which vastly improved the ride from the midfoot forward. 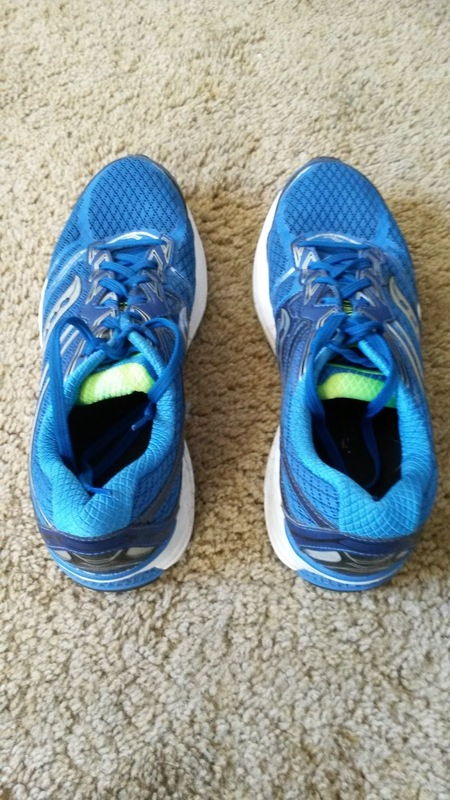 Previous versions of the Guide have had an extremely stiff forefoot and while the Guide 9 is not the most flexible shoe (and I personally found the forefoot to still be a bit stiff until after 100 miles of wear), it is much better. Fit/Feel/Upper: The major issue I have had with prior Saucony trainers has been the narrower forefoot. That issue has been fixed with the Guide 9. I did not try the Triumph ISO 1 but found a similarly good fit in the Triumph ISO 2. The Guide 9 has a flexible forefoot mesh that combined with a wider toebox creates a comfortable and accommodating fit. If you have extremely wide feet I would suggest getting the 2E version. For most, the normal width will be just fine. The heel and midfoot hold the foot very well and although I use a special lacing technique to help hold my heel in all my shoes, I don't think it is necessary in the Guide 9. In terms of sizing, the Guide 9 fits very true to size. Size 10 is what I usually wear and that fits me perfectly in this shoe. Weight/Responsiveness: As expected, the Guide 9 is a traditionally supportive, +10oz trainer. As I alluded to earlier, the EverRun topsole does not provide explosive energy return. Rather it provides a little extra rebound and shock absorption that I noticed especially on longer runs. On my 16-20 mile runs, I could still feel a little bit of pop from the shoe toward the end where I normally start to get dead legs. Additionally, despite being a traditional trainer with a >10oz weight, this shoe does respond to pick ups in speed. 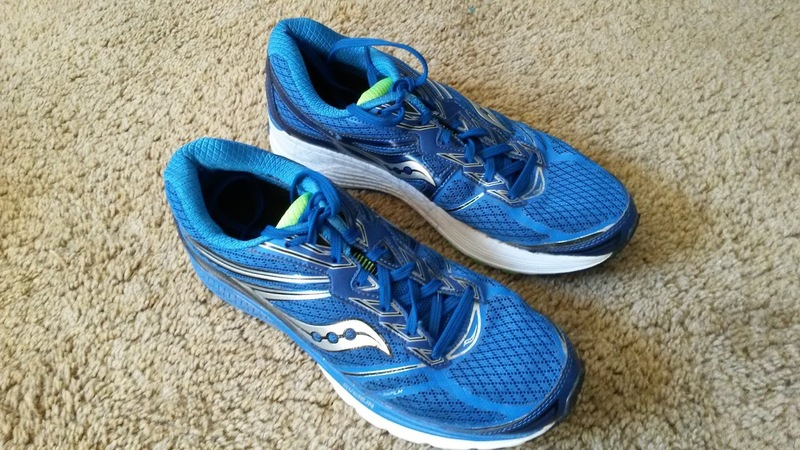 It felt good to do strides at the end of runs in this shoe, which may be some minor energy return from the EverRun, but they are not the shoe I would choose for workouts. At most I would consider doing an uptempo run in them, but I much prefer racing flats, marathon racers (Adidas Adios, Nike Streak, NB 1400) or lightweight trainers for even tempo runs. 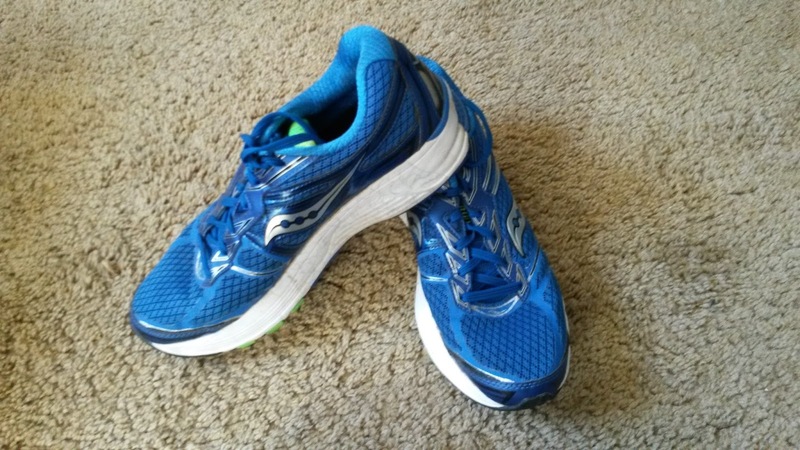 The Guide 9 is a shoe meant for logging miles in during normal training and long runs. Thoughts as a DPT (Student): I am very happy that Saucony kept their supportive shoe on the firmer side. As I have discussed in previous posts, a firmer surface is inherently more stable. Think of walking on concrete vs a water bed. Shoes that combine soft midsoles with stability do not make sense to me. A prime example of how not to do this is the Brooks Transcend (at least version one. I have not tried version two because I hated the first one). I found that shoe to be extremely soft and although I found the guide rails attempting to push and guide my foot, the overly soft midsole created an unstable ride. A gait analysis by a colleague further confirmed my feelings and suspicions as my legs collapsed and moved all over the place throughout stance phase bilaterally. The EverRun Topsole, unlike the Adidas Boost, does not lend to a super soft ride. This is likely due to the fact that Saucony decided only to use a little bit in the shoe rather than filling large portions of the midsole. I do like being able to feel this material right against my foot on top of firmer EVA. Adidas does the exact opposite with firmer EVA on top of Boost. Which means your base is soft and unstable. The Adidas Adios Boost series is probably one of the few shoes in their line that can get away with this because of the extended torsion system into the forefoot that helps with a stable, firm and snappy ride (that shoe also has less midsole in general being a marathon racer). I do like Boost and the new TPU midsoles coming out. I just think that they have to be applied appropriately. And as someone with highly flexible feet, I do not respond well to very soft midsoles. Other individuals with more rigid lower extremities and feet will enjoy them because the shoes provide the shock absorption their bodies struggle with. It all depends on the person. Conclusion: I was pleasantly surprised by many qualities of the Guide 9. The upper fit is more accommodating and has a better shape than previous versions. The ride can feel moderately lively with the addition of the EverRun topsole and the support is integrated very well, making for a smooth riding moderate stability shoe. I am extremely impressed with the shoes Saucony is putting out recently. I hope they integrate full length EverRun into their racing flats, because I believe that is where that material will truly shine. Word on the street is that the Type A7 will continue to be a full EVA midsole, but hopefully the Type A8 and Fastwitch 8 will get those upgrades. In the meantime, if you need a moderate support stability trainer with a great fit and ride that will keep you going for long miles, take a look at the Saucony Guide 9. These shoes were a provided for free after winning the 2015 Megan's Wings 5k from Fleet Feet Rancho Cucamonga. I put at least 100 miles on every pair of shoes before I review them (except racing flats which I put on at least 50 miles). Currently I have 215 miles on my pair.